After an explosive entrance to Formula One at the end of the 2009 season with Toyota, Kamui Kobayashi looked like one of the sports most exciting prospects. However, after three years at Sauber between 2010 and 2012 he lost his seat to better funded drivers and had to spend a year racing Ferrari sports cars. For 2014 he returned with Caterham, partly thanks to money raised by fans since 2012. Affectionately nicknamed Cowboyashi and Ko-Wasabi by the media, he put in several scintillating performances during the 2010 season and led the Sauber team into battle in 2011 and again in 2012. Kobayashi's motorsport career began in karting and he won four titles between the ages of nine and 16. In 2004 he signed up to Toyota's Driver Academy and made the move into Formula Renault, travelling around the world from his native Japan. The following year he took both the Italian and European titles with six race victories in each. In 2006 he graduated into the Formula 3 Euroseries, finishing the season sixth behind team-mates Paul di Resta and Sebastian Vettel - champion and runner-up respectively. The following year a single race victory was enough to take fourth place, with team-mate Romain Grosjean taking the title with six wins. 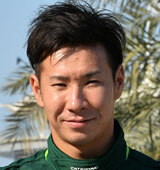 At the end of the 2007 season, Kobayashi was confirmed as test driver for Toyota's F1 team, replacing Franck Montagny. Alongside his F1 testing duties, he joined the GP2 Asia Series and with two race wins he took sixth place overall. He then moved to the main series and, despite an impressive start to the 2008 season finishing fifth and first in his debut weekend in Barcelona, he could only manage 16th place in the standings. He took the GP2 Asia Series title the following winter, beating team-mate Jerome d'Ambrosio to the top spot. However, disappointing results in the 2009 main series saw him finish 16th once more. Kobayashi's first steps into the F1 paddock as a race driver were at the ideal location in front of his home crowd in Suzuka, substituting for the unwell Timo Glock in Friday practice. However, Glock recovered in time for Saturday's action, only to be injured after crashing in the final qualifying session. The FIA refused to give Toyota permission for Kobayashi to compete in his debut race, as rules state a driver must complete qualifying to be eligible. However, with Glock suffering from a fractured vertebrae, Kobayashi was given his chance just two weeks later and made his debut at the Brazilian Grand Prix. He finished the race tenth, just outside the points, but caught the world's attention when he battled hard with soon-to-be-crowned champion Jenson Button. At the final race of the season in Abu Dhabi he picked up his first F1 points with sixth place after qualifying 12th. However, when Toyota announced its withdrawal from the sport with immediate effect at the end of the season, the son of a sushi chef was facing a future back in the kitchen. Fortunately Peter Sauber was looking to recruit a bright young star after buying back control of his team from BMW, which was also leaving the sport. Kobayashi had a slow start to 2010, but as the reliability of the car improved so did his results. Although he only qualified in the top ten four times, he made the most of alternative strategies to race through the field and amount 32 points by the end of the season. 2011 wasn't quite so productive, but that was more down to Sauber halting development on the exhaust-blown diffuser, which cost the team performance compared to others. He amassed 27 of his 30 points in the first half of the season, and although the weight of expectation as team leader seemed to affect him, he still showed flashes of brilliance such as his fifth place in Monaco and running second for a long period in Canada. In 2012 he upped his game again and scored 60 points in the competitive Sauber C31. The highlight of his career to date came at the Japanese Grand Prix, where he put in a determined performance to take the first podium of his career. However, despite showing strong pace in a competitive car, Kobayashi was pushed out of the team at the end of the year with Nico Hulkenberg and Esteban Gutierrez coming in for 2013. Kobayashi raised £1 million through an appeal on his personal website, and in 2014 it earned him enough to pay for a seat at Caterham. The year was one to forget, however, and Kobayashi was dropped for the Italian Grand Prix before the team missed two races after falling into administration. He returned for the finale in Abu Dhabi but the team's - and Kobyashi's - future in Formula One remains uncertain. Clearly unfazed by his rivals, Kobayashi is ambitious, aggressive and will make a move even when the smallest gap is presented. However, he has also acquired a reputation as a dangerous driver, with Button labelling him as "absolutely crazy". Scoring his first podium at his home race at Suzuka. Losing his Sauber seat at the end of 2013 despite his most competitive season to date and raising a budget of €8 million. "I have to say, being a Formula One driver is not what I expected when I was a small boy because it is about more than just driving and working on the car; there are so many other tasks that I need to do. It's obvious to me now but when I was a young boy I just assumed racing drivers spent their days only racing cars!" As a child, Kobayashi wanted to be a stand-up comedian and joined his school comedy club before turning to racing.